The MMG combines aspects of the Thematic Apperception Test (TAT) with those of classic questionnaires. 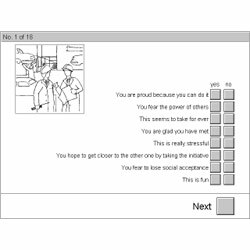 Similar to the TAT, 18 pictures are presented which provide a well-balanced set of situations linked to performance, control, and social acceptance. These pictures are accompanied by statements that represent important motivational states. Main areas of application: personality aptitude diagnostics, industrial and organizational psychology, as well as health psychology. Hope for social acceptance (acceptance) and Fear of rejection (acceptance). Results of a factor analysis recommend a three-factor constellation: a fear factor (fear of failure, fear of losing control, and fear of rejection), a factor that represents the hope for performance and control (hope for success and for control), and a third factor hope for acceptance. After the instruction phase, the items (pictures and statements) are presented on the screen one after the other. The respondent indicates his / her answer in a bipolar scale (yes / no). She or he may not omit answers. There is one test form with 18 pictures. The internal consistency (Cronbach's Alpha) of the scales varies between r=.78 and r=.90. Studies have shown that individuals with achievement motivation perform better on a management training course and individuals with high control motivation benefit more from this kind of training. Wegge, Quaeck and Kleinbeck (1996) investigated the influence of motives – measured by the MMG, the TAT and a questionnaire (AMS) – on subjects' video game preferences. Subjects were shown three games which they could choose between; the selection consisted of a game involving fighting, an adventure game and a simulated motor cycle race. Fear of failure was a good predictor for the length of playing time. Fear of losing control and fear of failure were good predictors of the amount of time the subject spent with the games. Individuals with high hope for affiliation had by far the strongest preference for the adventure game. When asked about their general preferences with regard to video games, individuals with high hope for affiliation mentioned the games' colour and music, while individuals with high hope for success particularly enjoyed games in which they could determine the difficulty level themselves. Computer norms are available for a representative sample of for N=390 individuals aged between 16 and 81 who were tested in the research laboratory of the Schuhfried company. These norms are also available as subsamples separated according to age and gender.